The Lagos State Government on Wednesday sealed off a Petrol Filling Station, an Hotel and Event Centre belonging to a suspected Badoo cult kingpin, Alhaji Alaka Abayomi Kamal. The structures, situated along Ijebu-Ode-Itoikin Road in Sabo area of Ikorodu were sealed for violating the State’s Urban and Regional Planning Law of 2010. The Police, had on December 22, 2017, declared Alaka wanted in connection with series of well-orchestrated killings and nefarious activities of the Badoo cult group in Ikorodu and Epe area of the State. Alaka is believed to be the ring leader of the Badoo menace. The State Government, in a statement by the Commissioner for Information and Strategy, Mr Steve Ayorinde, said the order sealing off the structures was in pursuant to Section 60 of the said Law. It would be recalled that the State’s Commissioner of Police, Mr Imohimi Edgal, on Tuesday, paraded a Badoo kingpin arrested in Ikorodu axis who confessed to the killings and took Police to their shrine in Imosan, a suburb of Ijebu-Ode, Ogun State where the group’s chief herbalist, Fatai Adebayo was arrested. Adebayo, who is popularly known as Alese, was said to specialize in administering oath on Badoo members before they go for any operation. According to Ayorinde, “The Lagos State Government is joining the Nigerian Police in asking the said Alaka to come out of hiding and submit himself to the law in his own interest. “The State Government has also enjoined the Police to offer the public a reward for any useful information on the owner of the Alaka Filling Station, Hotel and Event Centre in Ikorodu. “The government is once again asking its citizens to go about their businesses without fear. We will leave no stone unturned in keeping the State safe in 2018,” Ayorinde assured. 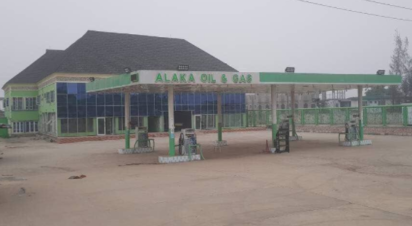 The post Alaka, suspected Badoo kingpin’s filling station, hotel, event centre sealed appeared first on Vanguard News.